The history of the Jewish experience in New York in the 20th century can be told through the history of the agencies that welcomed Jewish immigrants to America, acclimatized them to their new surroundings, and gave them the encouragement and skills to succeed in their new environment - while still holding fast to their Jewish heritage. The Milstein Family Jewish Communal Archive Project website is part of a three year program, generously funded by the Milstein Family Foundation and its successor the PIM (Paul and Irma Milstein) Foundation. It was developed in response to a growing awareness of the need to preserve the records documenting the history and contribution of the Jewish communal agencies in New York City. This project, led by the YIVO Institute for Jewish Research, seeks to preserve this archival heritage and to encourage scholarship in the areas of Jewish social and cultural history in New York. Over the past century, Jewish social service agencies have amassed a vast and extraordinarily rich archive of documents, photographs, and other materials documenting the history of the New York Jewish community. Recognizing the importance of preserving the heritage of twentieth century Jewish immigration and history in New York, the project was conceived in order to stimulate interest in exploring the treasures of these archives and to publicize each agency’s history and contribution. In addition, the agencies will be working with YIVO to preserve their own historic records and make them available to scholars. These agencies represent a cross-section of the social, educational, religious, occupational, recreational and vocational life of the Jewish immigrants and served as models to the community at large. The Milstein Family Foundation and its successor the Paul and Irma Milstein Foundation which can now be found online at http://www.paulandirmamilsteinfoundation.org, recognizing the importance of this history, have generously funded the Communal Archive Project in conjunction with the YIVO Institute for Jewish Research. The 92nd Street Y, the Educational Alliance, FEGS Health and Human Services (FEGS), New York Association for New Americans (NYANA), and Surprise Lake Camp were chosen for this project because of their importance to the history of Jews in New York and for the richness of their organizational records. As a major archival repository, with more than six decades of experience in the field of preserving Jewish organizational records, YIVO was selected to lead the project. In the histories and records of these agencies, spanning more than 100 years, one can find both individual stories and the story of collaborative efforts by the Jewish community to meet the needs of Jewish New Yorkers. Moreover, YIVO, the 92nd Street Y, the Educational Alliance, FEGS , NYANA and Surprise Lake Camp continue to play a vital part in Jewish life in New York. All of these agencies have played a major role in ameliorating the lives of millions of Jews and enriching their communities. Although they have changed and adapted to the needs of the communities where they reside and operate, they have never abandoned the commitment to preserve their Jewish roots. The work of the Educational Alliance began in 1889 through the efforts of the Hebrew Free School Association, the Young Men’s Hebrew Association, and the Aguilar Free Library Society. Their current name dates to 1893. 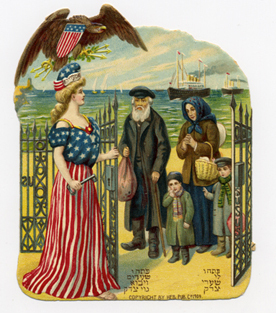 Somewhat wary of the waves of Jewish immigrants entering New York, the already established Jewish community of New York City, including Jacob H. Schiff, Samuel Greenbaum, Myer S. Isaacs, Joseph Blumenthal, Isidor Strauss, and others, nevertheless agreed that the newcomers must be “Americanized”. Today the Alliance continues to serve new immigrants and to maintain programs for the Jewish community in New York City and its environs. Joseph Elemental was the President of the Young Men’s Hebrew Association and Jacob Schiff was a donor of the Association. It was founded in 1874 and is now known as the 92nd Street Y. The Y is dedicated to the development of cultural and educational programs in the New York area. Both the Y and the Educational Alliance were founders of Surprise Lake Camp. Opened by the Educational Alliance in 1902 in Cold Spring, New York the Alliance Camp, as it was then known, provided summer vacations to Jewish boys from the tenements. In 1911 the 92nd Street Y and the Educational Alliance jointly operated The Alliance-Young Men’s Hebrew Association Camp. In 1917 Surprise Lake became an independent Federation Unit. Surprise Lake Camp currently accommodates over 400 children each summer and is the flagship camp of the Federation camping movement. Another Y board member, Jack Nadel, was instrumental to the founding of FEGS in 1934. Concerned about discrimination against Jewish workers and the duplication of services provided by many different Jewish agencies, Nadel advocated for the formation of a central employment bureau for New York’s Jewish population. Incorporated in 1934 as Federation Employment Service (FES) by the Federation of Jewish Philanthropies (now the UJA-Federation of New York) the agency today has over 3,000 employees providing services in healthcare, education, rehabilitation, vocational, residential, and developmental programs. The New York Association for New Americans (NYANA) was established in 1949 in the aftermath of World War II to resettle Jewish displaced persons. Between 1949 and 1952, NYANA helped resettle over 40,000 refugees. In the ensuing years NYANA served Jewish refugees from Greece, Egypt, Rumania, Cuba, Czechoslovakia, Poland, Syria and the former Soviet Union. In 1972, its program to aid Ugandan refugees was the first program for non-Jews. Other programs to help both Jewish and non-Jewish refugees followed it and NYANA continued to serve immigrants from all over the world settle in the New York area. until 2008 when a decision was made to close NYANA and transfer its archives to YIVO. An archival survey was conducted at each of the five agencies in order to identify the historically valuable portions of their records. The survey results are summarized in the collection descriptions on each agency’s home page. The 92nd Street Y and YIVO which have established archives, contributed descriptions of their collections for inclusion on the website. This website contains the findings of the archival survey as well as a selection of digitized images and documents from each of the agencies. The website summarizes the project findings and brings a rich sample of full text documents and photographs to the widest possible audience. The images, documents, and audio and video recordings selected for the digital gallery represent a cross-section of the agency’s programs, records and publications. In incorporating historical background and timelines for each of the participating agencies, the website creates a context for viewing the digital collection. Contact pages allow users to learn more about the agency’s current programs through links to the agencies own websites, and contain information on how to access historical records.